and then later after his birthday she let me know her friend loved them too. If you’ve bought something from a independent craftsperson which you love, why not let them know? I promise you it will make their day. 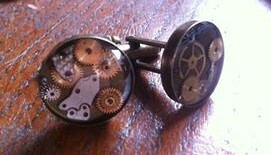 If you’d like to get yourself a piece of steampunk gorgeousness drop me a message, I’m aiming to launch an online shop at the end of the month, but in the meantime you can email me or use the contact form or find me on facebook, all my items can be posted. Alternatively find me at The Surrey Steampunk Convivial 19th & 20th November.